A natural, safe and palatable formula that promote weight management, provide essential nutrients and enhances cardiovascular wellness. Utilizes the best of quality barley that contained up to 25% Beta-Glucan imported from Canada. Accompanying with the king of beans: Soy bean, a protein source highly suitable for vegetarians. Rice brans are processed through a mechanical-hydrolysis technique to form small molecule of "α-polysaccharide-peptide (α-PSP)". Rich of active nutrient molecule α-PSP, complex carbohydrates, dietary fiber, amino acids, fatty acids, natural vitamins and minerals. The active nutrient molecule finer than body cell that can be absorbed directly by cells. 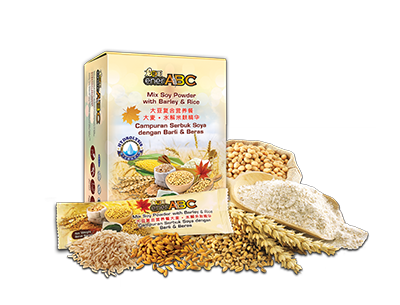 Soy, Barley with 25% Beta-Glucan, Long Grain Rice, Short Grain Rice, Fragrant Rice, Natural Vanilla Flavour. Provide essential wellness needs for modern people at a low-calorie formula that aids in slimming and health protection. Suitable for children, adult, senior citizen and vegan. Suggested taking 1-2 sachet daily before breakfast and / or dinner, 1 sachet per time. For more information, please contact MC-Ocean distributor.